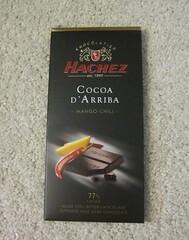 This candy bar combines many things I can't resist: very dark chocolate, mango, and chili peppers. I bought it along with 4 other chocolate bars when I had to restock, and had to break into this one first. From the gold details on the package to the crisp silver foil, everything about this bar's design was elegant. 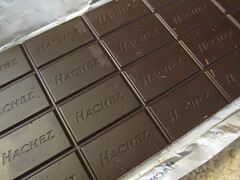 Inside the wrapper, the bar was a gorgeous, glossy brown - a total feast for the eyes. The lovely bar had a very crisp snap, but the 77% cocoa was a bit dry and chalky. The fruity flavor of the mango enhanced the fruity notes of the dark chocolate, but I think it would have benefited from a slightly lower cocoa percentage. The chili was very mild, so those with lower spicy tolerance may not need to avoid this bar. The combination of slight heat and mango with the bitter chocolate reminded me a bit of curry powder, which was a unique touch. The finish had a nice, tart mango flavor, but the texture of the bar was just too dry for the mango - and I normally love dark chocolate.